Britain, 1351. After an arduous exile to flee the darkness and danger sweeping her lands, Lady Elizabeth D’Auvers returns home to Woodell Castle, yearning only for her looms and her quiet life. To her astonishment, she finds the castle and farmlands thriving, thanks to Lord Thomas of Roxburgh, a knight errant whose size and strength offer protection to Elizabeth’s castle and its people. Lord Thomas’s warm gaze makes Elizabeth’s flesh burn with unaccustomed fire, and her defenses crumble, leaving her heart as vulnerable as her trembling body. Yet chilling thoughts trouble her mind. For there is something dark and mysterious about this man–a secret that makes him as forbidden to desire as he is impossible to resist. On a cold Candlemas Eve, the peasants of Woodell Village crowded into the church. They huddled there for warmth as much as for the mass, for beyond the walls raged a blizzard that had not stopped in three days. Candles burned in the gloom, flickering against the gusts that could not entirely be kept out, and Mary Gillian’s baby cried in bursts from the teeth pushing through his gums, giving voice to shivering number. Weary they were of winter, and longed for the warmth of spring. Tall Mary, so called for her ungainly height and to separate her from the other two Marys in the village, clutched her warm, woolen cloak around her. She gave silent thanks to Lady Elizabeth for it, even if she had ridden off and left the villagers here to face the uncertain future alone. The church doors suddenly burst open, letting in the cold and the night and the wind. The frightened villagers turned as one. Tall Mary’s heart pinched with terror as she thought of the brigands from the forest who had so plagued them these past few months. A giant stood in the arched doorway. Black hair fell wet and wild around his head, and his mantle was soaked. Behind him, snow rose in fierce whirls, white against the night. But Mary saw at once the rich mail he wore, finer even than Lord Philip’s, and she knew he was no thief. He moved into the church a few steps, and Mary, who sat toward the back, had a clear look at him. The hair would be thick and nearly black when dry, and even through the week’s growth of beard on his cheeks she saw the aristocratic cut of his chin and nose, the unmistakable intelligence in his eyes and high brow. He wore a fine green mantle with gold all around the edge, and at his waist hung a great sword with jewels set into the handle. He stood there, blinking, as if he were ill.
As the villagers stared, silent as awed children, a woman sailed past the knight. She was not of the same cloth as he. Mary saw the rough weave of her cloak, the threadbare places on her veil, the simple wooden cross hung about her neck. Still, she moved as if she knew what she was about—striding up the good stone tiles of the nave to kneel at the altar. She bowed her head and crossed herself, then turned to face the villagers, putting her back to the priest, who stood with his mouth agape at her boldness. Mary clutched her warm cloak to her chest, imprinting the scene upon her mind in all its detail. Around winter fires for years to come, this story would be told, and Mary would tell it best, for that was her only gift: remembering the things others forgot, and weaving them into a grand tale. She would remember to speak of the yellow light of the many candles burning in the gloom, and how that light glinted on the gold in his mantle, and how the jewels winked in the hilt of that great sword. The villagers gaped at her. Mary peeked at the man through her lashes, now admiring the thick muscles of his thighs beneath wet cloth. A shout of agreement rose. So it was that the knight was taken to the castle, where a fire was made for him, and food cooked. And at last, Mary herself led him to the finest chamber in the keep, where curtains hung round the bed, and even a rich Arabian carpet covered the floor. The knight knelt and touched it with his hand. “I’ve never seen such a thing,” he said, the first words he had spoke. It was a voice to match his size, a sound like drums rumbling on a feast night. Mary shivered at the sound. She liked him for not being so rich as the Lady Elizabeth, for being able to show his wonder over the finery in the room. She took his mantle, and rubbed his cold feet dry by the fire as water was carried up for his bath. And she saw that his hair did dry in thick waves over his shoulders, and his shaved jaw was strong and unmarked. And his hands, which were big as kettles, showed the size of other things, as the old women had always said. But when Mary would have stayed and warmed his bed, he gently sent her away. She bowed without rancor, and promised she would come back. She also knew, even if he did not, that she would not be alone in offering her favors. Smiling, she clutched her fine mantle around her shoulders and descended the cold dark steps from the tower. For a few minutes, she let herself imagine that she was not Tall Mary, simple daughter of the village reeve, but the Lady Elizabeth herself, beautiful cousin to the king. She tossed her head and imagined Lord Thomas was her own man, come home to her after a long journey. For the first time, Mary forgot her low anger at the Lady Elizabeth, and was grateful the lady was gone, leaving Mary to order things in her absence. With great relish, she looked forward to the days ahead. On the Feast of St. John, Lady Elizabeth D’Auvers, after a long and arduous exile, returned at last to the county of her birth. It was a fine, clear day, filled with the comforting noise of birds calling and small animals skittering in the underbrush of the thick forests that lined the road. On a soft afternoon breeze blew the scent of copper from the river, and the evocative perfume of leaves on the forest floor. Lady Elizabeth, known to all as Lyssa, tilted back her head and breathed in the beloved scents. There had been days in months passed that she had believed she would never again smell those notes, nor feel the gentle summer sun upon her brow, nor see her home. The returning party was a ragged remainder of the near-army that had accompanied her retreat into exile. Of the thirty that had departed at Whitsuntide nearly a year before, only eight remained—her two young stepchildren, a handful of guards, and Nurse, who had been with Lyssa since her birth. As they neared a bend in the forest track, too small to be called a proper road, only the sound of the horses hooves clomping in the dust, and the jingle of their harnesses, broke the silence. The track turned, and Lyssa strained eagerly, leaning over the horse’s neck. And there—at last!—lay the castle. It perched on a rise amid the dark woods. From the easternmost curtain wall, the village tumbled down the gentle hill, the fields spreading out in verdant glory to the very edge of the river. Against the bright blue summer sky rose the thick forest. The scene was gilded with sunlight, and Lyssa’s heart near burst at the sight. One of her guards rode up beside her. “My lady, look!” Harry said, lifting a mailed arm to point. Elizabeth spied them, too. Villagers abroad, their feet light with the joyful quick-stepping rhythm of a feast day. It was midsummer, and there were preparations being made for the bonfires that would blaze from every hill come evening. For a moment, Elizabeth was overcome. She fought tears of emotion. “How can it be that so many still live?” she whispered at last, her imagination haunted with grim memories of the deserted villages they had passed. Peggy chuckled and patted her roundness. “Aye,” she said with a ribald wink. “‘Tis good to be home,” she said fervently, and in great good humor, kissed his ruddy cheek. With a last glance over her shoulder, Lyssa lifted her skirts and walked the rest of the way to the open gates. She feasted her eyes upon the gold stones of the curtain wall, and the crenelated towers at each corner of the castle itself. After the hasty and unwelcome exile, it was all unbearably dear. She eyed the arched embrasures circling the southwest tower, and thought of the warm, sunny room it contained. There sat her untended loom, and piles of wool and linen to be carded, and threads so finely spun from her hands that the fairies themselves would be envious. Lyssa scowled. “Count your blessings, young miss,” she said, and strode ahead. Something would have to be done with the girl before she poured her boredom into the intrigues of which she was so fond. But not even Isobel could ruin this homecoming. Stepping through the deep shadows below the gate, Lyssa lifted her skirts, so eager now to touch her things that she was almost running. Within the bailey, she halted abruptly. A man stood close by the well, drinking water with such thirsty abandon that it spilled from the dipper down his chin and over his bare chest in a silvery fall. A very large stranger, a giant made all of shining darkness. Black hair fell in a thick wash over shoulders broad as the ancient rowan by the river, and his skin was dark as a Saracen’s, but whether by blood or sun, she could not tell. She stared at him with her hands clutched tight in the folds of her skirts to hide her fear-whitened knuckles from him, and tried to calm the sudden rush of her breath. If he were a brigand, already here in the keep, were there others with him? Behind her, she heard Harry draw his sword with a scrape of metal against metal. Wariness settled on the stranger. He put aside the dipper and spread his hands to show he held no weapon. Not that it would make much difference—a man so large as this would need no weapon. 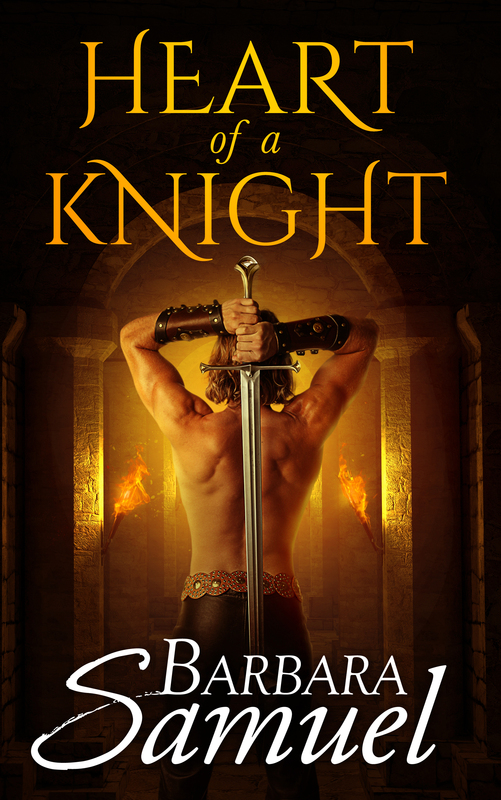 His thighs were thick as the ceiling beams in the great hall, and his bare belly was ridged with muscle. Lyssa glanced over her shoulder in alarm, thinking first of Isobel. The girl and her younger brother, Robert, had dismounted, and now they held each other’s hands. Too often on their long journey had they all fought off thieves and outlaws. Lyssa saw that Isobel had drawn her veil forward to hide herself. Her men stood at the ready, swords drawn, faces grim. Swallowing, Lyssa turned back. “You must be the lady Elizabeth, returned from your exile by the sea,” the stranger said. His voice matched him—a rumble of darkness resonating from deep within the broad chest. He took a step, into a finger of light slanting over the wall, and briefly, Lyssa forgot her fear. The light struck his eyes and they were not black, as she first believed, but a vibrant, liquid indigo, startling against the dark, hard planes of his face. Lyssa did not think she had ever seen a man she thought worthy of being named beautiful, and even now, it was a strange word for one so powerful and masculine, but it was the word that best fit him. More surprised than anything, she simply stared. Thomas bowed low in greeting, his heart in his chest a swollen, thudding beast. He had not known the lady would be so fair. “Like as not,” he agreed. Small and richly garbed in a dark blue surcoat, she stood like a fierce little cat against a wolf. Gold thread laced her sleeves, shining brightly in the shadows cast by the guard tower. A simple girdle circled her waist, and no jewels winked on her fingers or wrists. She needed no adornment but her hair. Dark and woven elaborately with ribbons of several colors, it hung well past her hips from below a simple veil. Thomas thought, looking at her,so this is why they fight —the great lords and the kings —for noble women such as this . Casually, he reached for his tunic and tugged it over his head, trying to calm the unsettled rush of his blood. It almost hurt him to look at her. But as if he saw such women every hour of every day, Thomas combed his hair from his face with his fingers. He waited, knowing she would speak if he left the silence long enough. “Within.” He gestured to the steps and waited to let her and her young charges climb ahead of him. Her guards shoved themselves between Thomas and the lady, barely veiling their suspicious gazes. He smiled at them, easier with men than with so fine a lady. Then he lifted his gaze and watched Lady Elizabeth sway up the steps, her hips moving sweetly beneath the blue velvet, her laced, elaborate braid shifting from side to side with each movement. Thomas bounded up the steps behind her guards, and joined them in the great hall. It was dim at this late afternoon hour. Still, he was glad Alice had put villagers to work in here, for the room smelled of lavender. Cobwebs had been swept from the corners. A low fire chased the chill from the great expanse of stone. The floor was bare of the rushes and herbs that would cover it later, and the men’s spurs made a crisp clanging noise against the stone tiles, bouncing in echoes from the high, timbered ceiling. Feeling proprietary against his will, Thomas glanced around and wished it were morning. The light was clear and cheerful here mornings—she would see they had tended her keep well. From some hidden turn on the stairs, a dog suddenly howled in mournful greeting, then gave a glad bark. The dog needed naught but her mistress’s voice. With a flurry of barks and whines and short, low howls, the dog scrambled down the stone steps and joyously hurtled herself across the floor, nails clattering over the stone. It was a wolfhound, with thick gray fur and bright eyes and a thick curled tail. Lady Elizabeth knelt in her fine gown to greet the hound with open arms and the dog flung herself with a whine into her embrace. Thomas had called the dog Daisy for the relentless good humor, but Griselda suited her well. He grinned as woman and dog embraced. Griselda quivered with joy, a low whine coming from her throat, and she covered her mistress’s face with polite, quick kisses. For her part, Lady Elizabeth put her arms around the dog and buried her face in its fur, murmuring softly. Thomas thought she might be weeping, and it plucked his heart a little. Now down the steps came a second hound. Thomas saw the pup galloping toward the lady and her dog, and called out sharply. “No, Wolf!” but the eight-month pup, exuberant to a fault, ignored him and leapt upon his mother and her mistress eagerly. Thomas tried to catch the oversized, golden creature, but Lady Elizabeth reached for the pup, laughing. “Griselda, he’s a beauty!” She captured the pup’s great head and scrubbed his ears in greeting. Gleefully, he slurped at her face, and she laughed again. “Aye. The king?” She tilted her chin, as if to berate him for his ignorance of her high nobility. Thomas felt a stab of real fear. ‘Twas a dangerous ruse he played—more dangerous still with one so high born as this. Thomas narrowed his eyes—did she know how bawdy that sounded? A hint of a smile touched the edge of the bowed red mouth, but she turned away before he could be sure. “Come, children,” she said to a girl covered in a gauzy veil and a sullen-looking boy of about twelve. A servant dressed in heavy black shooed them all toward the steps, sparing a single narrow-eyed glance at Thomas. The veiled girl tagged behind. Deliberately, she pulled the gauzy covering from her head, to reveal a tangle of palest gold curls, and wide, knowing eyes in the face of an angel-child. No more than fifteen or sixteen, and too bold by half, he thought, but rewarded the child with a half-smile of appreciation, together with a slight nod. Beauty, he had learned, required only recognition. Appeased, she tossed her head and climbed the stairs with the seductive sway of a serpent.